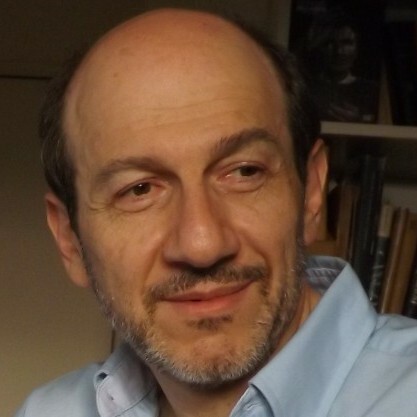 Carlos Grätzer was born in Buenos Aires, Argentina, in 1956. He was given his musical training by his father, the Austrian-Argentine composer Guillermo Graetzer, who had been a student of Paul Hindemith. 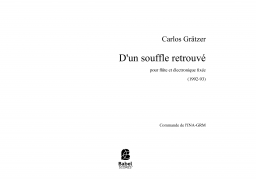 For a few years, Carlos Grätzer worked in the fields both of cinema (animated films) and music. He has dedicated himself exclusively to music since 1980. In 1984, he received a scholarship from the French government and came to Paris, where he has settled. There, he continued his studies at the Conservatoire Supérieur de Musique de Paris. He also studied with André Boucourechliev and has participated in master class of Helmut Lachemmann, Klaus Huber, Pierre Boulez, Franco Donatoni, as well as in the training course of the Upic -CEMAMU-. He was invited to the Summer course of Darmstadt in 1986 and in 1989, he participated in the Computer Music Session for Composers at the IRCAM. In 1995 and 1999 he was invited to the Composers Conference at Wellesley College, USA. Carlos Grätzer has received many awards; in particular the Buenos Aires City award “Premio Municipal of Buenos Aires”. He was a prize-winner at the 19th and 26th International Electroacoustic Music Competition in Bourges (1991 and 1999), and a finalist at the Boston University’s ALEA III, International Composition Competition. 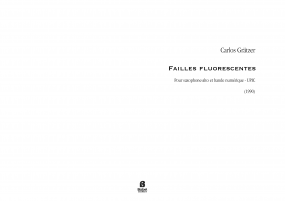 In 1995, the International Music Council of UNESCO recommended his work Failles fluorescents, at the International Rostrum of Composers. In addition, Aura (par-delà les résonances) for trumpet and 11 instruments was selected for the World Music Days 2000 (ISCM Luxembourg) and won the Concerto Competition of the Symposium Franco-European de la Trompette. Of his catalog may be mentioned: Découvertes (1985) commissioned by the French Ministry of the Culture, premiered by the “Ensemble 2e2m” at the Georges Pompidou Centre; Failles fluorescents (1991) commissioned by the “UPIC” for the 70th anniversary of Iannis Xenakis, premiered at Radio France; Desarraigo premiered by Roberto Aussel (guitar); Mouvements (1993) premiered by Ensemble Alea at the Tsai Performance Center, Boston University, U.S.A.; Aura (par-delà les résonances) (1996) commissioned by Radio France and premiered by the Philharmonic Orchestra of Radio France, it was subsequently played at the World Music Days 2000 in Luxembourg by the Ensemble Intercontemporain, conducted by Jonathan Nott; Ausbruch (1997), commissioned by the INA GRM; Transmutango (1999) premiered at the Festival Musica of Strasbourg and selected to be included in the program for the saxophone prize of the Conservatoire National Supérieur de Musique de Paris; Trio en 5 mouvements (2001) commissioned by Radio France to be broadcast in the radio program Alla Brève. Liens, written in honor of Iannis Xenakis was commissioned by the Greek Ministry of Culture and the Hellenic Delegation at UNESCO, and was premiered by Dimitri Vassilakis (piano) and Daniel Ciampolini (percussion) at Radio France. 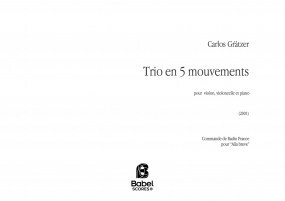 Cinq études pour quatre altos, pedagogical work written at the request of Christophe Desjardins and commissioned by the CRR of Paris. On the lasts years, Carlos Grätzer has been worked in several music projects for silent film. In 2005, he received a commission by the French Ministry of culture to write the music for John Emerson’s picture The mystery of the leaping fish and Buster Keaton’s Sherlock Jr, that was premiered at the 22nd European Festival of short films at the Quartz in Brest, by the Ensemble Sillages, then was played in Paris, Lyon, Madrid-Auditorio Nacional, Suisse-Victoria Hall. In 2010 the City of Geneva asked him to make a new project for silent films, for that occasion, he composed a score on Georges Meliès’ films, in homage for the 150th anniversary of the movies’ maker’s birth. The concert was premiered on June 2011 at the Geneva’s music day. His last project with the movie The wind by Victor Sjöström, commissioned by the French Ministry of Culture will be premiered by the Ensemble Sillages, in the Quartz, in Brest, in november 2014. The years 2014-2015, were marked by an interest of the composer in the orchestra. Consequently, two orchestral pieces came into being. 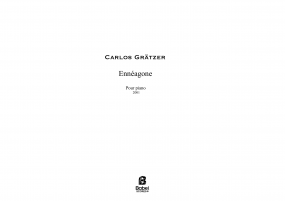 The first one, Etincelles, for wind orchestra, commissioned by French Republican Gard (Garde Républicaine de France), which was premiered on January 2015 and the second one, Éclaboussures du temps, for symphony orchestra, commissioned by Radio France for the “National Orchestra of France”.